1. 1987 batch Kerala cadre IAS TK Manoj Kumar has been appointed as joint secretary in the department of food and public distribution. 2. 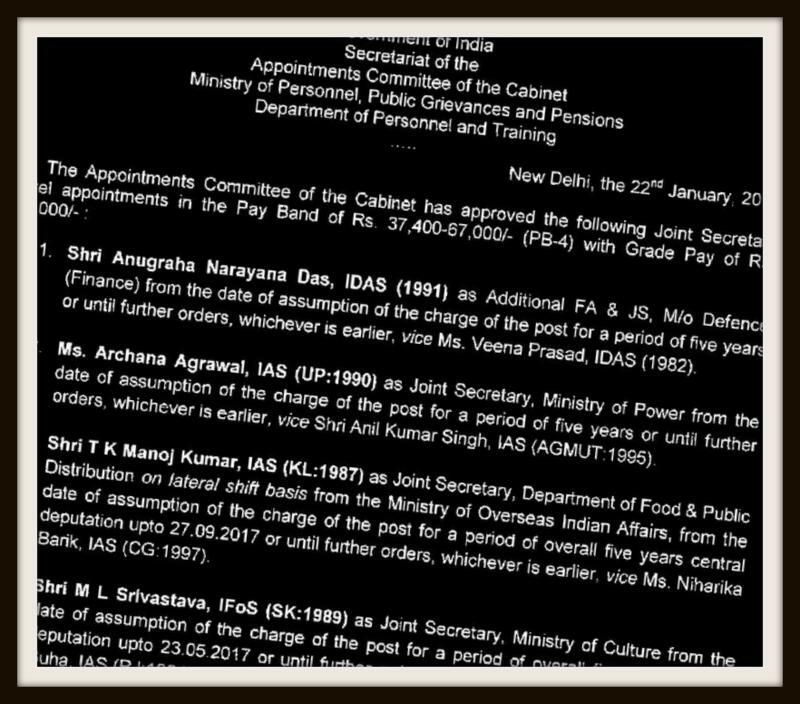 1990 batch UP cadre IAS Ms Archana Agrawal has been appointed as joint secretary in the ministry of power. 3. Asheesh Sharma, 1997 batch Maharashtra cadre IAS, has been appointed as joint secretary in ministry of skill development and entrepreneurship. 1. Bhaskar Jyoti Mahanta, 1988 batch Assam cadre IPS, has been appointed as joint secretary in the department of heavy industries. 1. CSS officer MC Luther has been appointed as joint secretary in DoPT on a lateral shift from the ministry of Overseas Indian Affairs. 2. 1996 batch CSS officer Ms L Indumathy has been appointed as secretary, BIFR at a joint secretary rank. BIFR comes under department of financial services. 3. 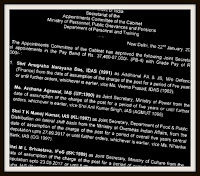 Anil Bahuguna, 1998 batch Central Secretariat Service (CSS) officer, has been appointed as joint secretary in the department of consumer affairs. 1. Anugraha Narayana Das, 1991 batch Indian Defence Accounts Service (IDAS) officer, has been appointed as FA and joint secretary in defence ministry. 1. Rajvir Singh, 1991 batch Indian Audit and Accounts Service officer, has been appointed as joint secretary in the department of sports. 1. Mukesh Nigam, 1985 batch Indian Railway Traffic Service (IRTS) officer, has been appointed as additional DGFT under the department of commerce. 1. ML Srivastava, 1989 batch Sikkim cadre Indian Forest Service officer, has been appointed as joint secretary in ministry culture.